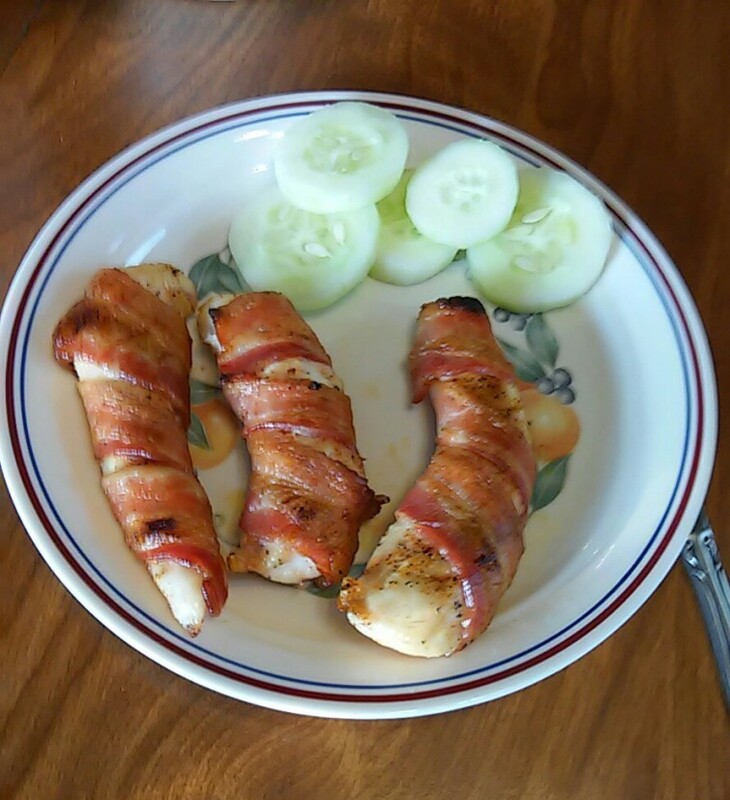 Chicken meets bacon… perhaps one of the best flavor combinations EVER! I have become the queen of quick meals and this one is at the top of my list. About the only way I will eat chicken breast is covered in mayo or wrapped in bacon and these fingers are perfect for the little fingers of my 2 boys. Serve alone or with my Bacon-Balsamic BBQ Sauce! In case you missed about my chaotic life, check out THIS post. Even though life is crazy with 2 little ones, I still find the time to feed them good food and to steer clear of processed and packaged foods. I keep lots of ground meat on hand (I am actually working on a NEW cookbook with only ground meat recipes) and I keep my freezer stocked with frozen veggies that I can steam and serve with butter or cheese. I also keep my Cajun House Seasoning on hand to sprinkle on EVERYTHING! Quick, easy, delicious and SO much better than a Lean Cuisine or Kid’s Cuisine. Check out the ingredients in a Chicken Nugget Kid’s Cuisine… it will make you sick! Looking for more meal ideas? Be sure to check out both my cookbooks available as eBooks and in spiral bound. Preheat oven to 375 degrees F. Using gloved hands (this cuts down on time from having to clean your hands and is much more sanitary), liberally season both sides of the chicken tenders with Cajun Seasoning. Then start at one end of the tender and wrap it with bacon. Place the tender on a cooling rack (oven-safe) on top of a cookie sheet to allow the bacon grease to drain. Bake for 20 minutes and then turn the broiler on and allow the bacon to crisp being careful not to burn. Serve with organic Ketchup or my Bacon-Balsamic BBQ Sauce. Vatiations: Place a slice of bell pepper, onion, jalapeno or even a sweet potato (cut into the shape of a fry) next to the chicken before wrapping in bacon. We have done something similar with strips of chicken and proscuitto – my husband can’t have the bacon due to nitrates. Very tasty. Will have to try it with your Cajun Seasoning next time. Have you tried making CRUNCHY versions of this? Take a bag of pork rids,add 1/2 t. plain gelatin (it helps coating stick better), run them through the food processor until they become dust, then shake-n-bake your bacon-wrapped chicken strips at 350 for 30 minutes so the bacon gets cooked. I made this for dinner the other night and they were delicious! My six-year old absolutely loved them. As a matter of fact, next time I make them I am going to have to double the recipe to make sure everyone in my family gets a fair portion! Thank you so much for sharing your recipes! I am going to try your Southern Pumpkin Delight tonight. Weather is turning cooler here in Kentucky and fall always makes me crave pumpkin!